Got a 64? Get this! If you had a C64 when you were young, you'll remember the waiting for the games to load from cassette. This can be even more "fun" now if you're lucky enough to have a working C64 and hope that your old collection of tapes still work everytime you fish them out of the cupboard and the head alignment on the datasette isn't off. This cool gadget does away with all that and lets you play your favourite games without all the hassle. So glad I got this and wish I'd had this all those years ago. 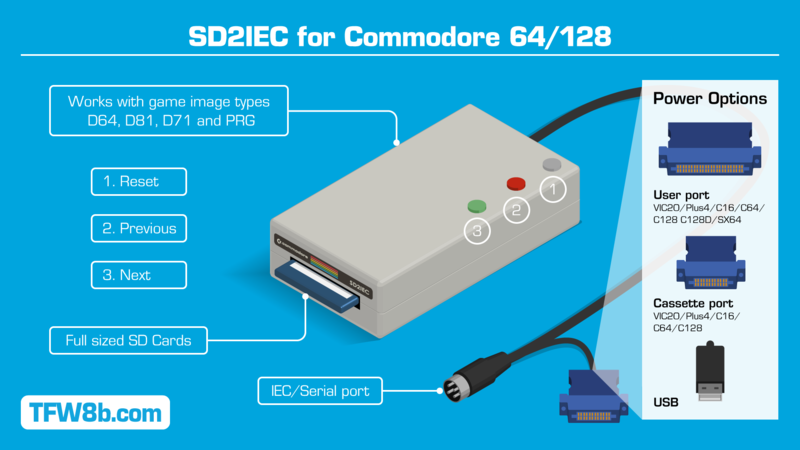 This SD2IEC is where it's at! This is seriously one of the coolest items that you could ever get for the C64 or 128. Forget 30-year-old disks, forget elderly, 40MB hard drives... this gives you the best of all of those worlds in a solid state package. Sure, SD2IECs have been around for a while, but what sets this one apart is the build quality. This thing feels like it would have been something that Commodore would've made, if they were still around and still doing anything with their 8-bit lineup. From the quality cabling, to the excellent construction, to the LEDs that work just like a real drives... right down to the little sticker on the front that says "Commodore." The textures and colors match, the SD card clicks into and out of place. And it SCREAMS with the Epyx Fastload Reloaded.